On Tuesday evening I attended Gen Art's presentation of Iran Inside Out: Influences of Homeland and Diaspora on the Artistic Language of 56 Contemporary Iranian Artists, a new exhibit on display at the Chelsea Art Museum (CAM) until September 5th. 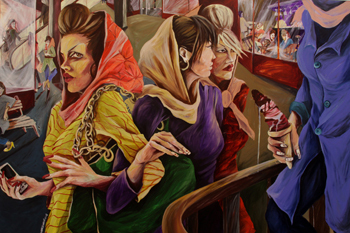 Wanting to gleam a different perspective on Iran than what I normally encounter in the news, I was eager to view works from a multitude of visionary artists, half of whom live in Iran while the other half have dispersed throughout the world. 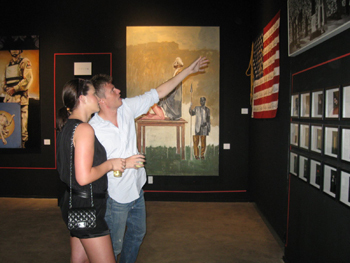 From the moment I entered the exhibit I was both shocked and enthralled by the creative artwork housed at CAM. 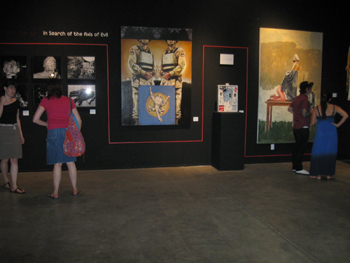 Using a wide variety of different media, the artists are clearly driven by the desire to provoke and challenge the ways in which many of us think about Iran and its relationship to the world, specifically to America. 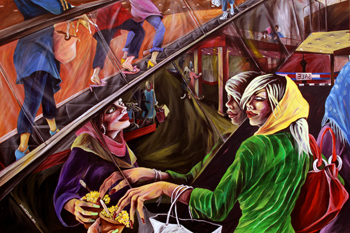 My favorite collection at the exhibit was Tehran Shopping Malls by Saghar Daeeri, who lives in Tehran. The paintings came to life with a stunning palette of vibrant colors and women depicted in a grotesque, almost fantastical rendering. Heavily made up faces, lacquered nails and peroxide hair instantly made me think these Iranian women were influenced by typical American ideals of beauty. However, Hanna Azemati, who works at CAM and presided over the show, offered a wonderful perspective that I hadn't originally considered. She told me that, "Because of the compulsory veil, women express their femininity through venues that are allowed in exaggerated ways. They resort to excessive make-up, overdone highlighted hair, thin eyebrows, long colored nails and even suggestive behavior." This dualism that Iranian women must grapple with, between veiling and self-expression, was communicated with profound contradiction and was really quite mesmerizing. One of Hanna's favorite works at the exhibit is the Oil Barrel series by Shiva Ahmadi, who used oil barrels from Texas as sculpture. Hanna said that Ahmadi, fascinated with oil politics, believes that, "Current problems in Iran, as well as the driver of key events in the past, are rooted in this curse of being endowed with natural resources." The bejeweled Persian designs on the barrels are meant to "symbolize the prosperity that comes with oil," said Hanna, while the "deformed shape of the oil barrels... the blood streaming and images of headless horses... make a statement on the violence and conflict, as well as the erosion of traditional culture." A sense of duality was apparent in all the various pieces I saw at the exhibit, and there is an interesting geographical duality influencing the artists as well. 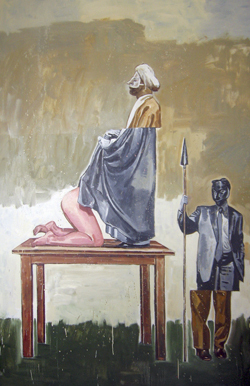 The artists still living in Iran must struggle with avoiding government censors while not compromising with self-censorship, and those living outside strive to assume an "unlabeled artist-status" within a West-centric contemporary art world. The museum reminds us of their important commonality, however, such that all 56 artists desire to "establish an individual artistic identity free from the stigma of "stereotype" and "locality." Conflict is myriad, multi-faceted, and complex beyond belief. My friend Tom Weeks, an associate producer at MSNBC, joined me at the exhibit and said, "Anyone who doesn't care about politics or anything outside the U.S. should walk out knowing that just because we don't have men and women wearing camo there, doesn't mean there isn't conflict." Indeed, Iran Inside Out offers a veritable platter of provocative work that begs for discussion, debate and perhaps most importantly, an open mind. I urge anyone and everyone to visit this exhibit at the Chelsea Art Museum, and reflect on a whole new way of looking at something from the outside in. Photos courtesy of Gen Art.